While grilling may be considered an “all American” pastime, we pride ourselves in making it a science. 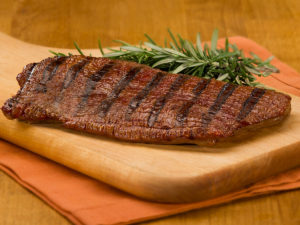 Perfectly grilled and seared chicken breast meat and beef flank steak are the result of a balance between heat, moisture, and speed. We have developed cooking methods that allow us to fine tune each of these components for each kind of meat. The result is lovely grill marks and a moist and tender bite. 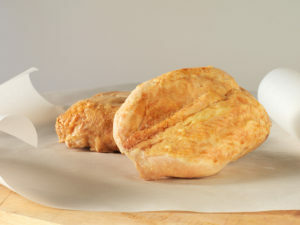 We pride ourselves in offering authentic grilled chicken and beef you will love serving at home. We have set up our ovens to slow roast and constantly baste our chickens and meats in their own juices. The result is perfectly glazed, juicy rotisserie chicken and roasts. This is a process that cannot be rushed. No short cuts are taken, patience both during the cooking and later in the handling of the meats during shredding are the secret to our signature flavor. We currently do not have any of our fried products available in retail. 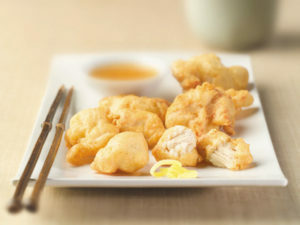 However in foodservice GoodHeart has made a reputation for having some of the most authentic, pillowy tempura battered chicken and pork available in the market. Our high temperature kettle-style frier is set up especially to allow these delicate morsels to be flash fried, resulting in authentic Japanese restaurant style tempura.